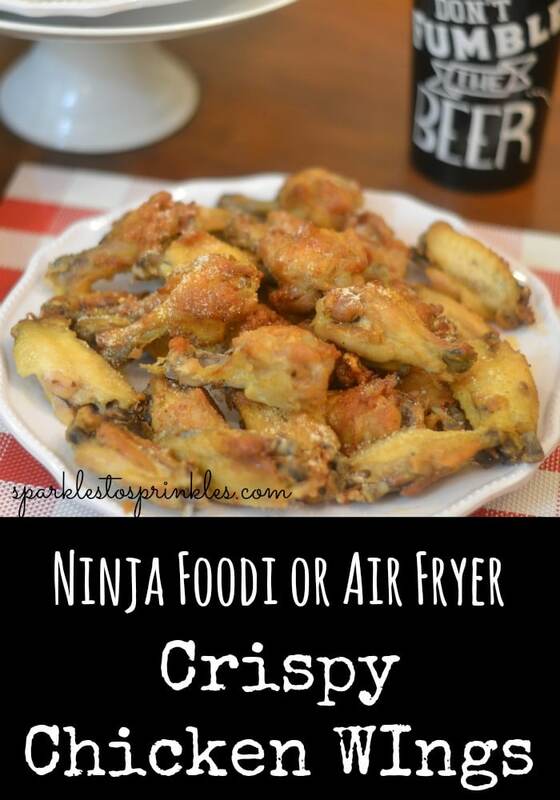 Crispy skin with a juicy center is what you get with these epic Ninja Foodi or Air Fryer Crispy Chicken Wings. So simple to make you can skip ordering takeout for your favorite crispy wings. Grab your favorite dipping sauce and dive in as you root for your favorite team as they play off to see who wins it all! Chicken wings are a favorite in our home, and when the football game is on, wings are a must. There is something about those small sticky and juicy wings that just scream football. I used my Ninja Foodi for these wings, but you can also use your Instant Pot then toss the wings in to oven to crisp up the skin when done. The Ninja Foodi does it all, cooks the wings under pressure to help lock in moisture, then switch to crisping lid to get your wings nice and crispy on outside but leave the juicy center! Trust me these wings are outstanding! 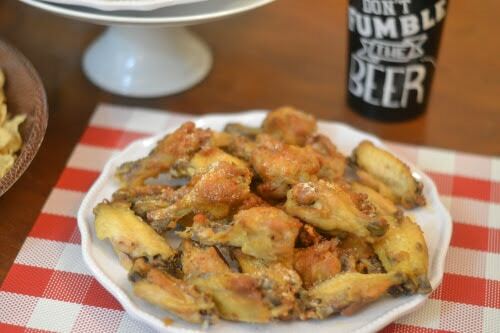 I love using Season all seasoning on my wings, it offers the right amount of flavor. Then sit out all your favorite dipping sauces and let people choose what to dip in. Blue cheese dressing, the classic buffalo wing sauce, or even ranch or barbecue. Or if you are like some you won’t even need the sauce cause these beauties are magical enough on their own! Follow my recipe below to make the ultimate crispy wings. The process is quick and painless and in no time you have fresh hot and juicy crispy wings. You got to try this recipe and see how you all like it! Since I tried making crispy chicken wings in my Ninja Foodi we rarely buy them anymore. 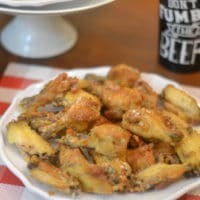 Making homemade crispy wings is so much more affordable and you can create a variety of flavors if you want to give you different elements of flavor. Once you get the method down on making them, venture out and try new seasonings like a bbq rub, lemon pepper, buffalo seasoned and more. I actually made 3 appetizers in one sitting back to back in my Ninja Foodi! I made deviled eggs, these crispy wings, and even a chicken taco dip. Best part is I didn’t have to clean my pot in between used. It saved me so much time and within no time I had three delicious and easy game day appetizers ready to serve up family and friends! If you are like me and want to maximize your time in the kitchen, consider making these other 2 appetizers as well. Or do one of the other two if you don’t want all three. Then once your fully done cooking you have 1 cleanup time! So what are you waiting for? Give this recipe a try today and blow your guests out of the water with the best crispy wings recipe in town! Place your wingettes into your pot. Once wingettes are done, do a quick release. Remove them to a plate. Dump leftover broth or water that is left in your pot. Pour melted butter over the wings. Mix wingettes gently around to coat well with butter. Give a good sprinkle of Season All. Close the crisping lid. Press Air Crisp, time will automatically be set to 20 min, keep that. Ar Crisp for 10 minutes, open your lid and mix the wings around gently, to make sure most parts of your wings are getting crisp. Sprinkle with Season All. close your lid and continue to air crisp for 5-10 min longer depending on your desired crispness.